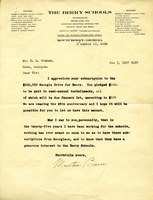 This is a letter of appreciation for Mr. Hoyt's subscription to the $100,000 Georgia Drive for Berry and pledge of $100. 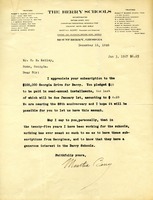 Martha Berry reminds Mr Kelley of his $6.25 installment payment on his pledged subscription to the $100,000 Georgia drive for Berry. 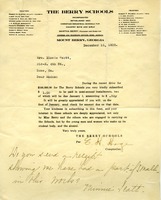 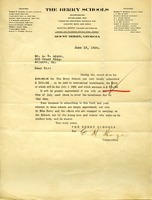 Letter to Minnie Scott from E. H. Hoge asking her to send the semi-annual installment she pledged to send to the schools. 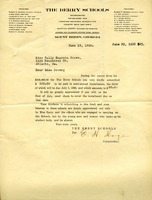 The letter informs Miss Sally Brown that her first installment payment for her $100 donation is due on the first of July. 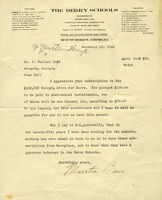 A $25 payment is recorded on June 29, 1926.